An audit is a comprehensive and detailed review of the employer’s health and safety management system. To qualify for a COR, the audit must be carried out by a qualified auditor, using an audit instrument that is approved for Partnerships use and is accepted by Alberta Association for Safety Partnerships (AASP) – See AuditTool. The audit will cover the basic elements of a health and safety management system and will include documentation review, interviews and observation techniques. Documentation reviews will include confirmation of existence and the review of relevant health and safety policies, standard operating processes, forms, inspections, etc. Interviewing your employees to validate that they are aware of the health and safety program content and process. An observation tour of your worksite to verify that the health and safety program has been implemented and is followed. The COR/SECOR certifications are generally, but not always (See exceptions below), tied to a 3-year cycle of auditing. (* there are exceptions see FAQ). 2. The first audit is a certification Self-Assessment Audit and if the employer achieves 80% overall and no less than 50% for each of the 8 program elements, the employer will be awarded with a 3 Year Small Employer Certificate of Recognition (SECOR). 3. This is followed by a 2 year maintenance cycle during which time the employer has to complete 2 maintenance self-assessment that must be completed by December 31 of each calendar year. Although these maintenance audits are scored the status of the SECOR will not be affected if the score is lower than 80%. 4. To maintain your SECOR Status a recertification audit must be completed after 3 years and the cycle starts again. 2. The employer must achieve 80% overall and no less than 50% in each of the eight program elements to be awarded a 3 year Certificate of Recognition (COR). 3. This is followed by a 2 year maintenance cycle during which time the employer must complete a maintenance audit each year with all information gathering completed on or before December 31 or each calendar year. Although these maintenance audit are scored they do not affect the status of the employers COR if less than 80% is achieved. 4. To maintain your COR Status a recertification audit must be completed after 3 years and the cycle starts again. 5. 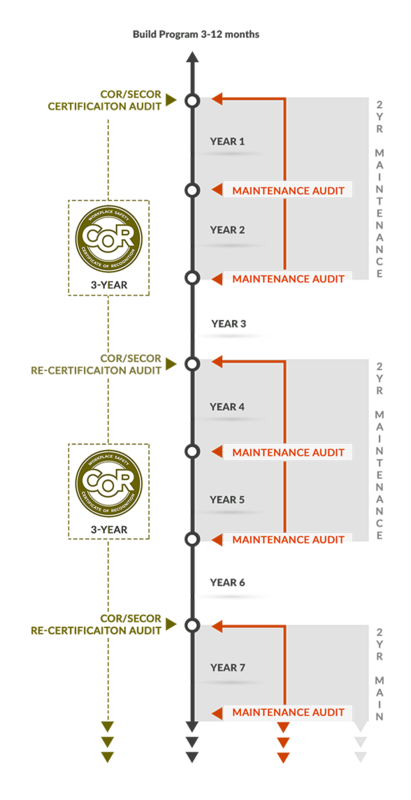 The only exception to the maintenance audit cycle is that if a company scores over 90% on the recertification audit the employer qualifies to apply to use a maintenance option. These options include: Safety Awareness ScoreCard (SASS); Corrective Action Report (CAR) or Action Plans.